In addition to helping your baby sleep safer, the HALO® SleepSack® swaddle helps baby sleep better, too. 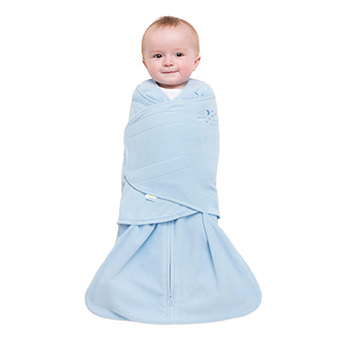 Its adjustable swaddle wrap immobilizes baby’s arms to prevent the “Moro” or startle reflex. And, it is the original 3-way adjustable swaddle that adjusts to your baby’s sleep style. Swaddle arms in, one or both arms out to ensure baby’s best sleep and an easy and gentle transition to the SleepSack wearable blanket when it is time to stop swaddling. It’s the easy and safe way to swaddle. Every baby has different sleep preferences. The adjustable HALO SleepSack swaddle provides 3 easy ways to swaddle to ensure your baby’s best sleep and to help make the transition from swaddling easier. See why swaddling with HALO is easy. Our inverted zipper means diaper changes are easy as there is no need to unswaddle your baby. Strong, adjustable fasteners ensure the perfect, secure swaddle every time. Swaddling your baby has never been this easy. Our signature “Back is Best” message reminds all caregivers to put your baby on her back to sleep. 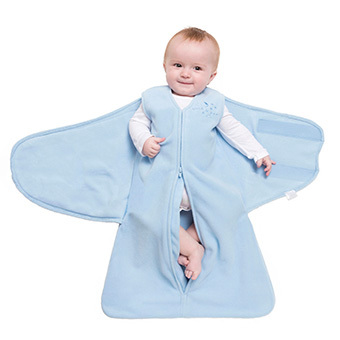 Dress baby in regular sleepwear and close the zipper. Fold left swaddle wing over baby’s right arm and torso, tucking under baby’s left arm. Swaddle wrap should be snug, below chin, and aligned with baby’s shoulders. We loved using HALO Swaddle blankets from day one with our daughter. We loved the peace of mind they gave us knowing she was sleeping safe. It also helped keep her arms secure when she couldn’t control her reflexes and would wake herself up in the early weeks. Halo also makes it easy to transition into the HALO SleepSack wearable blankets which what our daughter is currently using! 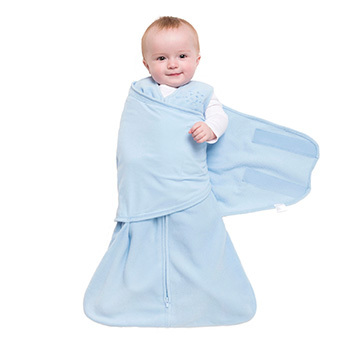 HALO SleepSack Swaddles are safe swaddling made easy. If you're like me, you like easy. A zipper and some velcro are so much easier to do in the dark than trying to wrap a blanket around a squirmy baby. Helps my daughter sleep through the night! Before buying the HALO SleepSack Swaddle, it was clear that our baby was not having restful sleep due to the Moro reflex, which would often wake her out of an otherwise sound sleep. After we started using the Sleep Sack Swaddle, she now sleeps through the night much more restfully -- and so do we! It makes diaper changes a breeze! The inverted zipper (which starts at the top and goes down) allows me to change his diaper without unswaddling him. I’ve decided that I need to pick up a few more to have on hand. Much easier than traditional swaddle! I will be honest, I didn’t think that I would use the HALO SleepSack that much when I first got it. You see, after working for 7 years in the NICU, I am a pro at swaddling babies. So, I figured that I would stick to my old swaddling ways. That all went straight out the window the first time I used the SleepSack Swaddle. This thing is awesome and honestly so much easier than traditional swaddle.